School-year desktop calendar with all-new illustrations! 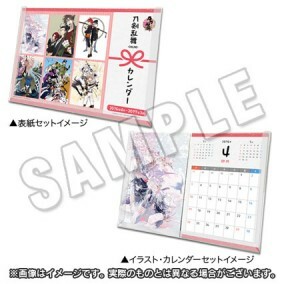 The Touken Ranbu school-year desktop calendar designed by Nitroplus is finally here! April 2016 - March 2017 calendar, with illustration cards that can also be used as postcards. IC Card Sticker - featuring print of Konnosuke and the Touken Danshi seal. ・These are the same products that were available at Comic Market 89, held at Tokyo Big Site Dec. 29-31, 2015, at the Ani Marche Yume-Shuchoujo FW & Movic Booth.